������ Situated in the heart of Northeastern Thailand, the small province of Maha Sarakham is considered to be a regional education centre, earning the name "Taksila of Isan" (Taksila was a city where education of all branches centered around in ancient India). The province also houses a sacred Buddha image and has many historical sites, with the province being the former site of the ancient Dvaravati city of Nakhon Champa Si. Maha Sarakham's beautiful hand woven silk and cotton fabrics are sought after for their original patterns. Maha Sarakham is 470 kilometres from Bangkok and has an area of approximately 5,291 square kilometres. The province is divided into the following districts: Muang, Kantharawichai, Kosum Phisai, Wapi Pathum, Borabue, Phayakkhaphum Phisai, Na Chueak, Chiang Yuen, Na Dun, Kae Dam,Yang Si Surat, Kut Rang and Chuen Chom. From Bangkok, take Highway No. 1 and Highway No. 2 to Nakhon Ratchasima and use Highway No.226 to Buri Ram, then take Highway No. 219 via Satuek, Phayakkhaphumphisai and Borabue to Maha Sarakham, a total distance of 475 kilometres. Air-conditioned and non air-conditioned buses depart from Bangkok's Mochit 2 Bus Terminal to Maha Sarakham every day. Contact Transport Co.Ltd at Tel: 0 2936 2852-66 for more information. The private-owned bus service providers include Mongkol Tour 0 4371 1072 Cherdchai Tour 0 4374 0359. There is no direct train from Bangkok to Maha Sarakham. Visitors can take a train to Khon Kaen and connect a bus to Maha Sarakham. for more information, call 1690, 0 2223 7010-20. Visitors can fly from Bangkok to Khon Kaen and then connect a bus to Maha Sarakham. For more information, call Thai Airways, Tel: 1566, 0 2280 0060, 0 2628 2000. Located east of Phra That Na Dun, the institute makes research on conserving, improving, and distributing flora of the region. It has bamboo terrain, herbal garden, Isan Cart Museum, and Isan traditional house museum that features different kinds of house in Isan such as Phu Thai house, Isan fishery house, Isan musician house, animal traps house, doctor house, and weaver’s house. Tourist can stay overnight in these unique and interesting houses. For more information, call 0-4379-7048, 0-4372-3539. Ku Santarat is on the way to Na Dun. To get there, take Highway No. 2040 past Kae Dam and Wapi Pathum, then turn right onto Road No. 2045 and drive for 1 kilometre. The site is a stone sanctuary built in the reign of King Jayavoraman VII. This Bayon-style building was completed during 1157-1207. This square laterite structure is similar to Ku Maha That. The front doorway has a remarkably beautiful lintel. Acquiring total area of 125 rais (50 acres) in Tambon Hua Khwang, by Chi River, the park was established on October 1, 1976. The shady park is home to different big trees such as Yang, Tabaek (Lagerstroemia floribunda Jack) and Kathum (Anthocephalus chinensis (Lamk.) A. Rich.ex Walp.) whose canopies connect to each other. With natural pond and scenery, this park is home to different kinds of bird, big herd of crab-eating macaque, as well as rare golden crab-eating macaque.Attractions in the park include. Kaeng Tat. Rapids in Chi River is situated at north and east of the park. Base rock acquires wide area in the river. When the river descends between November and May, shallow water allows rapids to appear. It has beautiful setting around the area. Lan Khoi. The terrain is occupied by toothbrush trees. Today, over 200 of them are bended into different shapes. Crab-eating macaque. The animals make this park their home. There are two kinds of crab-eating macaques in the park, the grey and golden macaque. How to get there, From Maha Sarakham City, take highway 208 for 28 kilometres. At Kosum Phisai Intersection, get into asphalt road and keep going for 450 metres. Ban Phaeng village is famous for making reed mats. It is 38 kilometres from town (Highway No. 208). The mats are local products that are used widely in Thailand. The village does extensive reed farming and has set up a reed-mat-making co-operative to demonstrate the process of making mats and sell them at very affordable prices. Ban Nong Khuean Chang is at Mu 7, Tambon Ban Song Khon. This village is renowned for making quality silk and cotton materials. It is 12 kilometres from town on the Maha Sarakham-Kosum Phisai Road. Turn left at the 12-km marker onto Highway No. 1027 and drive for 2 kilometres. Phra Yuen Mongkhon and Phra Ming Muang Buddha images are the most important Buddha images of the province. They are at Tambon Khan Than Rat on Highway No. 213, about 14 kilometres from town. The images are in the Dvaravati style and are made of red sandstone. It is believed that they can make rainfall in the rainy season. Legend says a man built the Ming Muang image, while a woman built the Yun Mongkhon image. Phra That Na Dun, or the Buddha Monthon of Isan, is the area where historical and archaeological findings that proved the magnificence of the ancient city of Champa Si were made. Artefacts found here are now on display at the Khon Kaen National Museum. The most important piece is the stupa (pagoda) encasing the holy relics of Lord Buddha in gold, silver and bronze caskets. The site was from the Dvaravati period of the 8th-10th century. This model for Phra That Na Dun comes alive every Makha Bucha Day. How to get there, From Maha Sarakham City, use highway 2040 via Amphoe Kae Dam and Wapi Pathum, turn right into highway 2045 to Amphoe Na Dun. Prathat is 65 kms from Maha Sarakham City. Ban Isan Museum is another interesting place that shows the way of life of the Isan people. It is located a short way from Phra That Na Dun. The museum is a research project of Maha Sarakham University. It comprises model houses of the various tribes in the region and there are exhibitions displaying household items. Situated in Amphoe Na Chueak, 60 kilometres from Maha Sarakham City, the area features two forest types namely deciduous dipterocarp forest and peat swamp forest which is nourished by stream all the time in particular spots. The area is rich in endemic and rare species for both flora and fauna. The most famous endemic species found here is Mealy Crab Thaipotamon chulabhon Naiyanetr, 1993, or Pu Thunkramom (named by HRH Princess Chulabhorn). A bit bigger than ricefield crab, this kind of crab is quite colourful in purple, orange, yellow, and white. Now, this endemic crab is enlisted as protected animals. This No-hunting area is also good for bird watching and studying the ecological system. For more information, call 08-1817-9441, 08-1799-5795. How to get there, Dun Lamphan No-hunting Area is situated on highway 219 (Borabue- Na Chueak-Phayakkhaphum Phisai), some 3 kilometres from Amphoe Na Chueak Office. The villaged is situated in Tambon Khwao, 4 kilometres from Maha Sarakham city via highway 23 (Maha Sarakham-Roi Et). 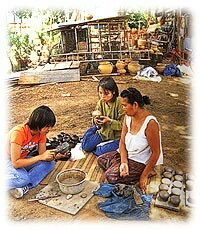 The villagers here inherited ancient method of pottery from their ancestor. From water pot and cooking pots, they have diversified their products into various design to cope with modern living style. Situated 10 kilometres from Maha Sarakham City, the lake is home to over 100 species of freshwater fish. It is a nice place where people can enjoy feeding the fish and relax. The big reservoir is situated back of Rajabhat Maha Sarakham University , some 3 kilometres from Maha Sarakham city. Around the area is fishery station which breeds and distributes different kinds of fresh water fish to provinces in the region. Beautiful scenery around the reservoir attracts a number of people to enjoy holiday here. Isan Arts and Culture Research Institute is in Maha Sarakham University. The institute has exhibits on Isan arts and culture. Of particular interest are displays on the origin of weaving, the development of local fabrics, basketry and woodwork, metalwork, the development of pottery, household items, animal traps and related tools, musical equipment, literature, ancient language inscriptions, and contemporary art of students, as well as various media on regional arts and culture for sale. Located in front of Lak Mueang Maha Sarakham School, the shrine was built since 1865 by Thao Mahachai, the first ruler of Maha Sarakham who has moved from Roi-Et to build new city here. The city shrine was built as a sacred icon of the city where Maha Sarakham people pay lot of respect. Chi Long Forest Park is at Ban Wang Wa, 10 kilometres from town on the way to Kosum Phisai. The park is on an island that was formed by a course divergence of the Mun River, a main waterway of the Northeast. The island is covered with shady rubber trees and a road circling it makes sightseeing most enjoyable. The 500-metre-long beach on the bank of Chi River is situated in Ban Tha Duea, Tambon Nong Bon. Tourist can get there via Kosum Phisai-Tha Phra-Khon Kaen Road. With clear and shallow water, the beach is a good place for relaxing. Facilities available on the beach include, beach beds, speed boat, banana boat, jet ski, donut ski, life vest and etc. The lake packed with elephant’s ear plants is a nice place to picnic for people in Kosum Phisai and nearby . Situated in Tambon Hua Khwang, 100 metres from Kosamphi Forest Park, the lake is 2.50 metres deep and acquires total area of 120 rais (48 acres). How to get there. Use the same way with Kosamphi Botanical Park.